50 year old Rebecca Weiss has been missing since August 11, 2012 when she reportedly vanished while free diving off the Los Angelos coast in a cove near Rancho Palos Verdes. Alan Weiss, the husband of the missing woman, told police that his wife went free diving alone and when she didn’t return, he went looking for her. He told authorities that he found his wife’s car in a parking lot and her dive bag on the shore where she presumably entered the water. The husband of a California woman who is believed to have vanished while diving off the Los Angeles coast is now being questioned by homicide detectives after investigators searched for her body for four days and failed to find it. Rebecca Weiss, 50, was free diving in a cove near Rancho Palos Verdes on Saturday, her husband, Alan Weiss, told police. Rebecca, an experienced diver, had gone diving alone, they say he told them. When she didn’t return, Alan, 60, said he went to search for her in areas where the two would frequently dive. He told authorities that he found his wife’s car in a parking lot and her dive bag on the shore where she presumably entered the water. Rebecca Weiss is described as a female Asian, 50 years old, black hair / brown eyes, 5’5” tall / 115 pounds, last seen leaving her residence in the 13000 block of Marina Pointe Drive, Marina Del Rey, wearing a wet suit. 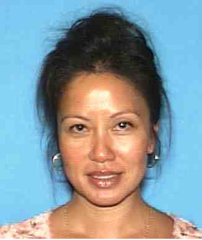 She left the location in a black 2006 BMW X5, California license plate 5UEJ690. Search for missing Rebecca Weiss. The following morning divers from the Sheriff’s Department Emergency Services and L.A. County Fire Department/Lifeguard Dive Division conducted an extensive search for Weiss. After two days, divers did not her. UPDATE I: Missing diver case: Detectives to interview husband. Rebecca Weiss’ mother says her daughter would never have gone diving alone. “It’s so weird for her to fall victim to the water. She’s a strong swimmer,” David Causey said. Officials said homicide detectives have been assigned to the case because there are some unusual circumstances with her disappearance. Detectives plan to speak to the woman’s husband in person. They said Alan Weiss is cooperating with the investigation, but they have only been talking to him over the phone. UPDATE II: Unidentified body was recovered off the coast of Rancho Palos Verdes, CA today. An unidentified body was recovered off the coast of Rancho Palos Verdes, Calif., today near the area where missing diver Rebecca Weiss is believed to have disappeared. The gender of the body has not yet been released by the Los Angeles County Sheriff’s Office, whose homicide detectives were on the scene today after they received a call that someone had found a body. UPDATE III: Coroner Investigator Elissa Fleak said the body had been identified as that of 50 year old Rebecca Weiss of Marina del Rey. No cause of death has been determined.